Photo caption: a student in Pesantren Haurkuning, Tasikmalaya, West Java, is learning how to present a speech, while the Kyai looks at him. The recent development of Indonesian Islam indicates that Islamic educational institutions survive amidst changes within Muslim communities. Pesantren, the oldest Islamic educational institution, is evidence of this. Pesantren, madrasah, and Islamic schools continue to grow and parental interest in sending their children to Islamic education institution is even stronger today than in the past. Data from the Department of Religious Affairs shows a steady increase in the number of pesantren and students enrolled in them. In 1977, there were 4,195 pesantren with 677,384 students. This number skyrocketed in 1981 with pesantren numbering 5,661 with a total of 938,397 students. In 1985, this number increased to 6,239 pesantren with 1,084,801 students. In 1997, the Department reported 9,388 pesantren a total of 1,770,768 students. 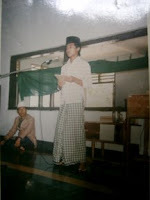 And finally, 2003-04, the number of pesantren reached 14,647. A similar trend is also evident with madrasah. Madrasah, managed by the Department of Religious Affairs, also experienced rapid quality and quantity development. Development trends are also evident in Islamic schools. For example, Al-Azhar School in Jakarta, Insan Cendikia and Madania in West Java, and Mutahhari in Bandung have grown significantly in urban regions of the country. Similar developments are also found in Yogyakarta, Surabaya, and Makassar. These data raise some important questions concerning the development and survival of Islamic educational institutions, as well as their changing roles amid transitions taking place in the Muslim community. Islamic educational institutions face complex challenges. They not only strive to educate Muslims in religious knowledge, but are also expected to participate in creating a new socio-cultural and political system of Indonesia. Based on the characteristics of Islamic educational institutions, there are at least four types of Islamic educational institutions: (1) NU-based Islamic boarding schools, (2) modern Islamic boarding schools whose orientation are Islamic reformism, (3) independent pesantrens, and (4) Islamic schools. Strong waves of Islamic education reform, which occurred along with Islamic reformism, touched pesantren. While maintaining the traditional aspects of the education system, a number of pesantren in Java have, at the same time, begun to adopt the madrasah system. The experience of Pesantren Tebuireng Jombang East Java is important to note. Founded by a charismatic and outstanding ulama of the 20th century, Kyai Hasyim Asy’ari (1871–1947), Pesantren Tebuireng set the model for pesantren and ulama, especially in Java. Almost all of the important pesantren in Java have been founded by disciples of Kyai Hasim Asy’ari, therefore following the Tebuireng model. Together with the NU, which he founded in 1926, Kyai Hasyim had a central and strategic position in the legacies of ulama in Java. As such, he is known as the Hadratus Syaikh (Big Master) for ulama in Java. Attempts to reform the educational system of pesantren began during the 1930s. The NU-based pesantren adopted the madrasah system by opening a six-grade system consisting of a preparatory grade for one year followed by a madrasah grade for six additional years. Furthermore the pesantren also included non-Islamic sciences in its curriculum such as Dutch language, history, geography, and math. This process continued as the pesantren was managed by his son Kyai Abdul Wahid Hasyim (1914– 53), whose concerns were to bring the legacies of pesantren into modernity. During the 1950s, he made madrasah system the main model of education in Tebuireng. Tebuireng was not the only pesantren to make changes to its system. Pesantren Krapyak of Yogyakarta also became part of the reformist movement in the early 20th century. Kyai Ali Maksum (1915–89), the founder and the pesantren leader of Krapyak was recognized as a figure with a “modernist spirit.” Like Kyai Wahid Hasyim of Tebuireng, he also combined the madrasah into pesantren systems. In addition, Pesantren Tambak Beras and Pesantren Rejoso, both in Jombang, also adopted reformist agenda by implementing the madrasah system by introducing non-Islamic knowledge into their curriculum. This type of pesantren, culturally based on the NU tradition, has been growing steadily and can be found in almost every city in Java. In West Sumatra, this type of pesantren is affiliated with Perti (Persatuan Tarbiyah Islamiyah), a kaum tua-affiliated organization like the NU in Java. In Lombok, West Nusa Tenggara, the position of NU is assumed by the local Nahdhatul Watan (NW). Like NU and Perti, NW has become the cultural bases for traditional Islamic education institutions in Lombok as well as religious bases in the region. Similarly, As’adiyah in South Sulawesi has also played an important role like that of NU in Java, NW in NTB, and Perti in West Sumatra. In the history of Islamic education in Indonesia, this type of pesantren is said to be the first institution to create the principles for reforming Islamic education within the pesantren system. Pesantren Darussalam Gontor Ponorogo, founded on September 20, 1926 by three brothers (KH. Ahmad Sahal, KH. Zainuddin Fannani, and KH. Imam Zarkasyi) was the first modern pesantren designed to provide education able to respond to challenges faced by the Muslim community amidst changes in the socio-cultural life in Indonesia in the modern-day period. Pesantren Gontor was founded during a period of important development for Indonesian Muslims. Forced by modernization by the Dutch colonial government (also known as “ethical politics”) and affected by changes in international networks centering Islamic reformism in Cairo, Egypt, Islamic education in Indonesia underwent fundamental changes. These changes were evident in the emergence of new Islamic educational institutions, especially those established by the first modern Muslim organization, Muhammadiyah, that adopted a modern system aimed at reforming the traditional educational system. As such, Islamic educational institutions became important parts of the Islamic reformism movement since the early 20th century. It is by this design that the foundation of Pesantren Gontor can be explained. It aimed to create new Muslims who could master either religious or secular knowledge as well as various life skills needed by the changing community. Since its inception, Gontor identified itself as a modern educational institution in contrast to a traditional pesantren which had been plagued with stagnancy and ineffective educational management. Imam Zarkasyi, one of Gontor’s founding fathers, saw that modern pesantren should apply freedom of thought, effective and efficient management, and adopt modern idea of progress (kemajuan) as well as modern devices. Like most Muslim reformers, he emphasized the need for madhab flexibility, which without would sometimes lead to stagnancy. One aspect of this modernization can be seen in the system of Kulliyat al-Muallimin al-Islamiyah (KMI), a secondary grade system consisting of a six-year duration (equivalent to secondary and high schools). This KMI system is a combination of madrasah and pesantren systems. This combination is a result of Zarkasyi’s experiences in Pesantren Manbaul Ulum Solo, Sumatera Thawalib Padang Panjang, and Normal Islam School (also called KMI) and as founder and director of Kweekschool Muhammadiyah in Padang Sidempuan. In the classroom, students study and learn just like students of madrasah and other public schools do. However, outside of the classroom, students engage in various activities such as organization training, life skills, arts, sports, and scouting. This concept of modern pesantren became the blueprint as a number of his students spread across the country established similar pesantren, usually called “the Alumni’s Pesantren” (meaning Gontor Alumni), named after the second generation who influenced the pesantren model in the next wave of development. From 1970–80, a number of Gontor alumni founded pesantren within their home regions. For example, Pesantren Daar El-Qalam Gintung Balaraja in Banten, Pesantren Al-Amin Prenduan Sumenep in Madura, and Pesantren Pabelan in Central Java, among many others. A new trend has recently emerged in Indonesia in the context of the development of pesantren and, to some extent, madrasah. This new trend is the presence of pesantren and madrasah that are independent in the sense that they have no affiliation with any Muslim mass organization. Instead, they are based largely on Salafi ideological beliefs. It is difficult to know precisely when this new trend emerged. Even so, it is believed that the presence of independent pesantren and schools are closely related to the rise of Salafism in Indonesia in the 1980s. During this period, the advent and influence of Salafism can be identified with the emergence of so-called usroh groups. From a religious doctrine perspective, these groups follow the earlier Salafi figures such as Ahmad ibn Hambal and Ibn Taymiyah whose ideas were absorbed and developed by later figures such as Hasan al-Banna and Sayyid Qutb through Ikhwan al-Muslimin in Egypt and Abu al-A’la al-Mawdudi through Jema’at Islami in the India sub-continent. The doctrines of Salafism as developed by these figures have become the main reference for these groups. To give an example, Pesantren Hidayatullah is based on contextualization of Salafi religious beliefs. This fact (to be demonstrated in the following section of statistical analysis) can be seen in the teachings developed by Ustadz Abdullah Said who created the idea of Muslim community (jemaah Islamiyah) (community who implements Islamic values in a comprehensive manner). Jemaah, in the context of the Islamic movement is frequently paralleled with hizb (party) and harakah (movement), although the concept of jemaah is used more widely than the other two. It is very frequently understood as a Muslim community more superior than others and as one claiming that the only solution they have is the correct one. Another important characteristic of this group is the model of literal interpretation toward religious texts. As a result, they have a distinct physical appearance. For instance, males wear ghamis (an Arab garment for men) and have long beards, while females wear jilbab and veil, covering all parts of their bodies except for the eyes and hands. According to Islamic teaching, females are not allowed to show their bodies except to their husbands. In Indonesia these groups have interestingly emerged in prominent public universities such Universitas Indonesia (UI), Institut Pertanian Bogor (IPB), Universitas Gadjah Mada (UGM), and Institut Teknologi Bandung (ITB). However, in Islamic universities such as State Islamic Institutes/Universities (UIN/IAIN), they are hardly found. After the fall of Suharto, groups calling themselves Lembaga Dakwah Kampus (LDK) began to emerge in predominantly Muslim universities. Their movement has become an important social and religious movement in Indonesia. At the political level, these groups gave support for the Partai Keadilan Sejahtera (Welfare Justice Party, PKS), one of the leading Muslim-based parties in Indonesia. In essence, the system and organization of Islamic schools is similar to public schools (although most of them necessitate being a Muslim as a requirement from students) with an emphasis on Islamic moral conduct. As such, these schools can be categorized as “public school plus.” This means that religious courses on Islamic history, Islamic jurisprudence, or Islamic theology are not the main subjects of the curriculum like that of pesantren and of most madrasah. Instead, there is an emphasis on how religion can inspire good moral conduct in the daily lives of the students. Islamic schools were created to cater to the Muslim middle class in urban areas. These schools are equipped with good facilities such as air-conditioned classrooms, libraries, labs, and computer facilities. As a modern institution, these schools are administered by professionals in management as well as curriculum development. Teachers, staff, and managers are recruited in a competitive and professional manner by considering their skills and competency levels. Yayasan Pesantren Islam (YPI) Al-Azhar, founded on April 7, 1952, is one of the best examples of Islamic schools. As of 2004, Al-Azhar has managed as many as 78 schools from kindergarten to high school, spread over several provinces including Jakarta, Banten, West Java, and East Java. In 2002, YPI founded a university named Universitas Al-Azhar Indonesia (UAI). In addition to Al-Azhar, other independent schools oriented toward science and technology include SMU Insan Cendikia in Banten and Gorontalo in Sulawesi. These schools were founded in 1996 by a number of scientists mostly affiliated with the Commission for Research, Development and Application of Technology (BPPT) under the Ministry of Research and Technology through the Science and Technology Equity Program (STEP) for schools within pesantren. During its development, Islamic schools have grown not only in Jakarta but also in other large cities throughout Indonesia. For example, in West Sumatra there exists Kompleks Perguruan Serambi Mekkah in Padang Panjang which is supported by members of PKS party. This “PKS’s model of Islamic schools develop its own characteristic by giving more emphasis on Science and Technology. In terms of religious orientation, it seems that PKS’s model of Islamic schools follows “moderate salafism.” Although PKS is closer to Salafism, it differs with radical salafism like FPI (Islamic Defense Front). Terima kasih juga, silahkan dimanfaatkan dengan seharusnya. Salam.